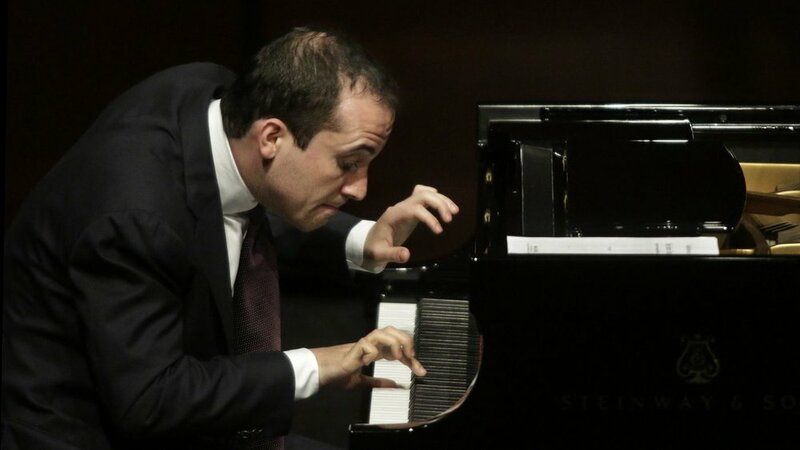 Igor Levit (piano), ‘Life’, Chan Centre, November 4, 2018. One has quickly come to identify pianist Igor Levit with far-reaching projects, but his ongoing international tour with ‘Life’ – a so entitled two-CD set just released for Sony – is a very personal statement, a response to the death of his close friend Hannes Malte Mahler in 2016. It was natural to expect a reflective feeling in the proceedings, the pianist probing into the myriad of subtle emotions between deep sorrow and hope. The music assembled for this purpose was innovative: a set of arrangements by Busoni, Brahms and Liszt, principally anchored in Bach. Since all works other than the opening Bach/Brahms Chaconne were played continuously, the recital achieved an overarchingly meditative quality, spawning a sense of almost endless improvisational development through varied and undulating terrain. Always noticeable was the patience and suspended beauty in Levit’s playing, often leading one to the darker and more fragile corners of intimate feeling yet always ready to coax out a richer redemption too. This was an experience for very late at night. It was an interesting choice to start with Brahms’ left-hand piano arrangement of Bach’s Chaconne in D minor, deriving from the composer’s solo violin Partita BWV1004. Levit moved it forth with tonal warmth and a considered sense of flow, paying close attention to both the rise and fall in the line of the counterpoint and the symmetry of phrase that affirm Bachian character. Even more conspicuous was the personal, speaking dimension in the playing, often musing softly in its own world but never shy of exposing an underlying nobility. The rubato and limpid articulation in its closing sections actually hinted at the otherworldliness of Beethoven’s last sonatas, and one is already aware how the pianist feels about these works. One finds greater eccentricity in Busoni’s Fantasia after J. S. Bach – and we now get the right hand of the piano too. The piece is marked Molto tranquillo e gravement and, while it does contain some explosive outbursts – inspiring a wonderfully granitic projection from Levit – it is the darker lyrical weavings of the piece that compel. The Lisztian opening revealed softly etched, filigree textures from the pianist, with coaxing rhapsodic flow, proceeding to the more suspended, searching postures with great sensitivity. For all the deliberation in Levit’s playing and his desire to probe darker corners, the approach was never wayward: a sense of line was maintained even at the softest volumes and slowest tempos and created a luminous narrative overall. The delicately woven, infinitely soft pianissimo at the end cast a genuine spell. It was Levit’s ability to convey so many different shades of emotional uncertainty, isolation, and hope that was distinctive. Schumann’s ‘Ghost Variations’ – the composer’s final work – held hands with the Busoni and followed as a contrasting ‘hymn’. Levit displayed pellucid counterpoint within a slightly more relaxed countenance early on, before moving to a greater sense of tenderness and forgiveness as the fragility of Schumann’s world was exposed. Liszt’s arrangement of Wagner’s ‘Solemn March to the Holy Grail’ (from Parsifal) suggested a more reverential tone – a sense of homage – and it was played with patience and inexorable flow. There was imposing architecture throughout and, again, it was the tenderness in Levit’s playing and his ability to open up a feeling of almost infinite space that was special. The closing Busoni arrangement of Liszt’s Fantasy and Fugue on ‘Ad nos ad salutarum undam’ gave the opportunity to move to more demonstrative emotions while revealing the pianist’s tonal strength and inspired virtuosity. One cannot deny that parts of this piece are forbiddingly overwritten: the peaceful Adagio stands as the most beautiful movement. The objective of the second part of the concert nonetheless became evident: to combine the inward emotional complications already exposed with much bigger and universal feelings – ones set on the world stage and beyond. The first movement of the fantasy sometimes sought a richer grandness of utterance and, after a beautifully appointed fugue, the third closed with an infinitely defining sense of redemption, mingling with a tenderness and forgiveness. The Adagio sought the innermost recesses of intimate feeling but also aimed at the celestial heavens. Amidst the more dramatic explorations – beautifully executed with clarity and gorgeous tonal weight – there was a feeling of the wondrous and transcendent, and sometimes a sensuality. Igor Levit offers quite a pathbreaking attempt to integrate these lesser-known arrangements into a telling and complete narrative – a ‘fantasy’ that twists on forever. While one might attempt to put the last three sonatas of Beethoven or Schubert together as a continuously-evolving package, it is simply an unusual idea to put these disparate works together, especially in transcription form. Just like hearing either book of the Well-Tempered Clavier – which is a lot what this concert felt like – the key to the pianist’s success lay in finding a set of defining structural anchors and emotional resonances that could serve as references throughout all the pieces and secure overall integration. On the other hand, it is quite possible that each work taken on its own might receive more individualized treatment, having a less shrouded veneer and marginally more buoyancy and sunlight. In this sense, some of Levit’s design and articulation could be construed as over-considered. But what a display of beautiful pianism and emotional depth this was! One would certainly be hard pressed to think of any other 31-year-old pianist who could combine this degree of concentration, sensitivity and technical mastery over such a complex emotional expanse.